The View from 2114? 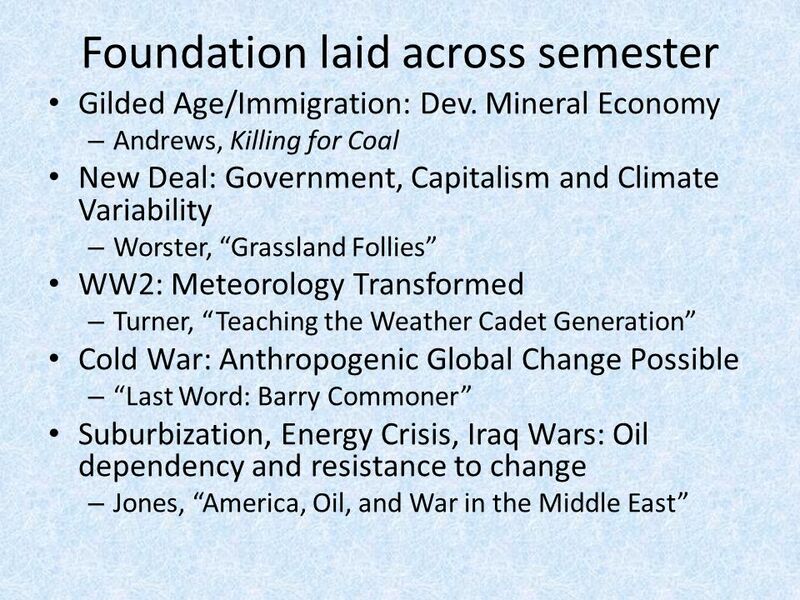 Climate Change in the American History Survey Roger Turner Associate Fellow, Dickinson College and Consulting Historian. 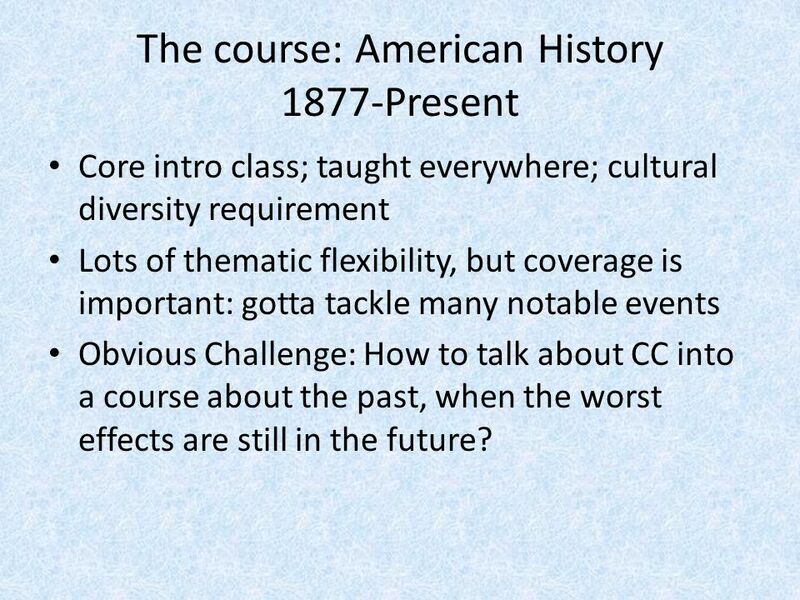 2 The course: American History 1877-Present Core intro class; taught everywhere; cultural diversity requirement Lots of thematic flexibility, but coverage is important: gotta tackle many notable events Obvious Challenge: How to talk about CC into a course about the past, when the worst effects are still in the future? 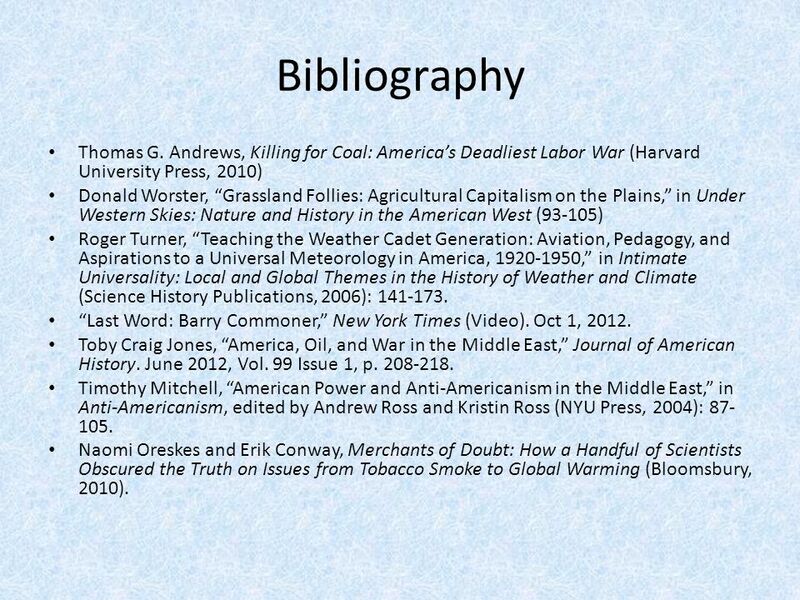 10 Bibliography Thomas G. Andrews, Killing for Coal: America’s Deadliest Labor War (Harvard University Press, 2010) Donald Worster, “Grassland Follies: Agricultural Capitalism on the Plains,” in Under Western Skies: Nature and History in the American West (93-105) Roger Turner, “Teaching the Weather Cadet Generation: Aviation, Pedagogy, and Aspirations to a Universal Meteorology in America, 1920-1950,” in Intimate Universality: Local and Global Themes in the History of Weather and Climate (Science History Publications, 2006): 141-173. “Last Word: Barry Commoner,” New York Times (Video). Oct 1, 2012. Toby Craig Jones, “America, Oil, and War in the Middle East,” Journal of American History. June 2012, Vol. 99 Issue 1, p. 208-218. Timothy Mitchell, “American Power and Anti-Americanism in the Middle East,” in Anti-Americanism, edited by Andrew Ross and Kristin Ross (NYU Press, 2004): 87- 105. 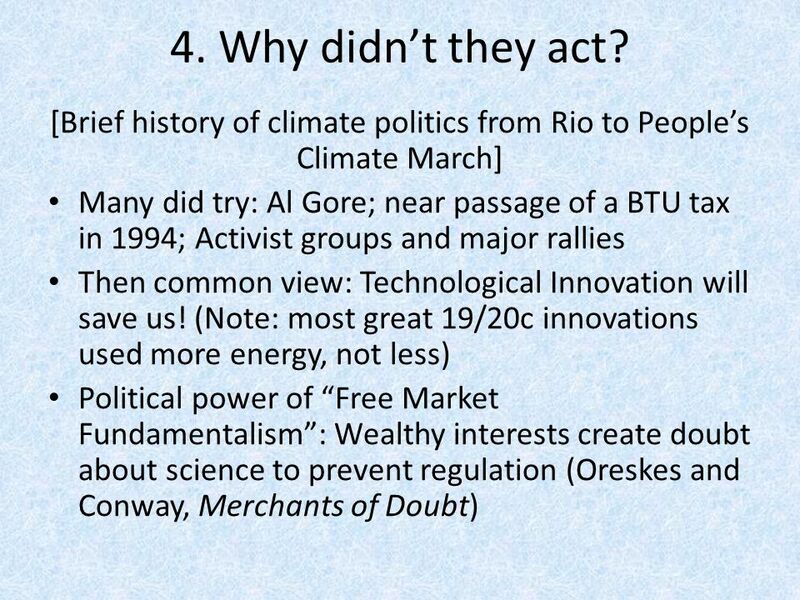 Naomi Oreskes and Erik Conway, Merchants of Doubt: How a Handful of Scientists Obscured the Truth on Issues from Tobacco Smoke to Global Warming (Bloomsbury, 2010). 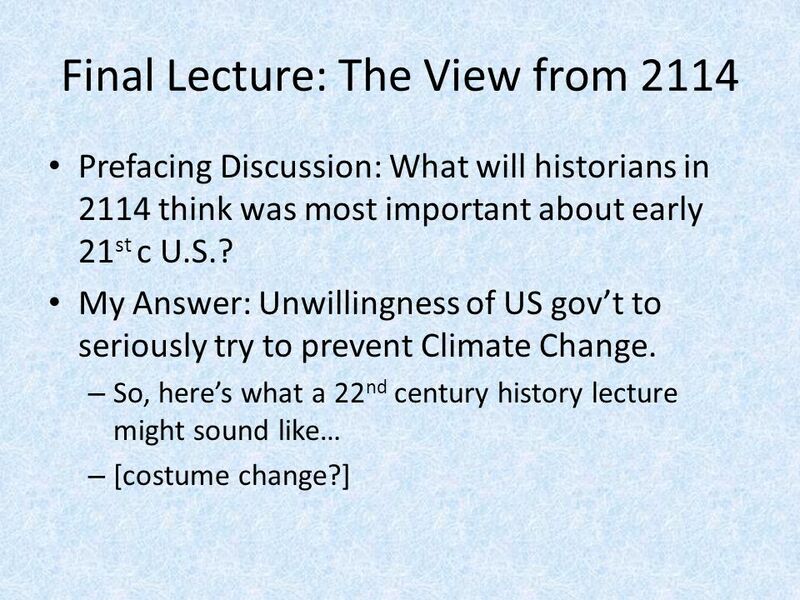 Download ppt "The View from 2114? 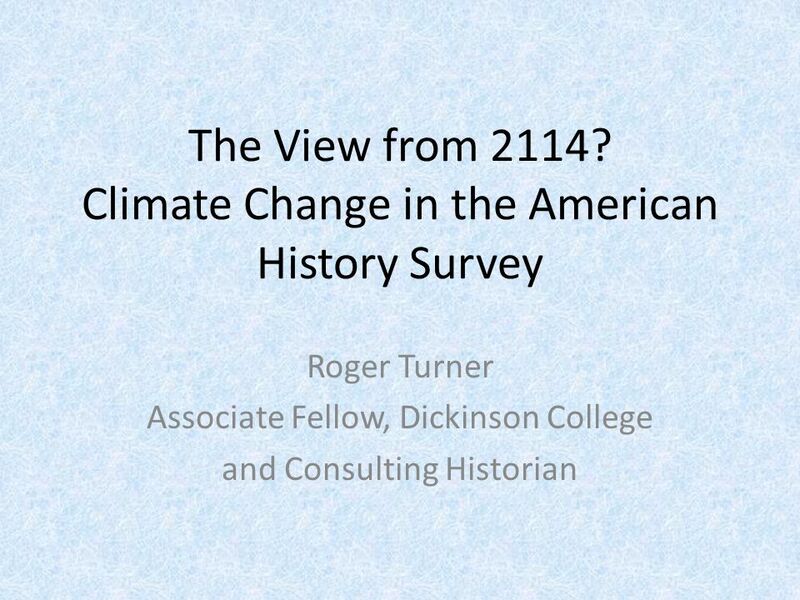 Climate Change in the American History Survey Roger Turner Associate Fellow, Dickinson College and Consulting Historian." What is History???. What did Chariots of Fire tell us about History??? Consequences Of a warmer earth. In our October 11, 2010, cover story, “A Message From Mother Nature?” you’ll read about the increase in the number of extreme weather events. Many scientists. Historical Themes Historical themes teach students to think conceptually about the American past and focus on historical change over time. 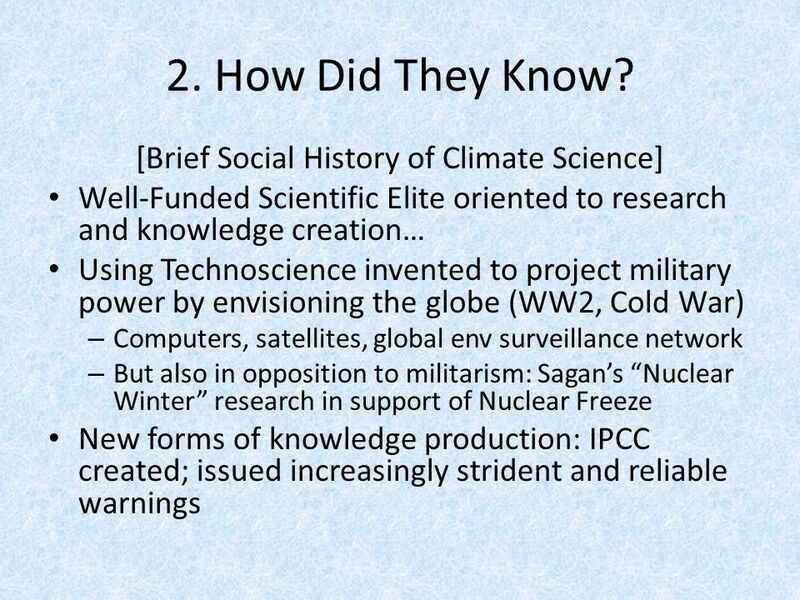 Unit 7: The World Since 1945 Unit Focus: How has the world changed and developed since the end of WW2 until now? All across the world, in every kind of environment and region known to man, increasingly dangerous weather patterns and devastating storms are abruptly. Chapter 6 North America and International Studies. Patterns of Immigration Identify patterns of immigration and the causal factors that led to immigration to the United States of America (i.e., crop. 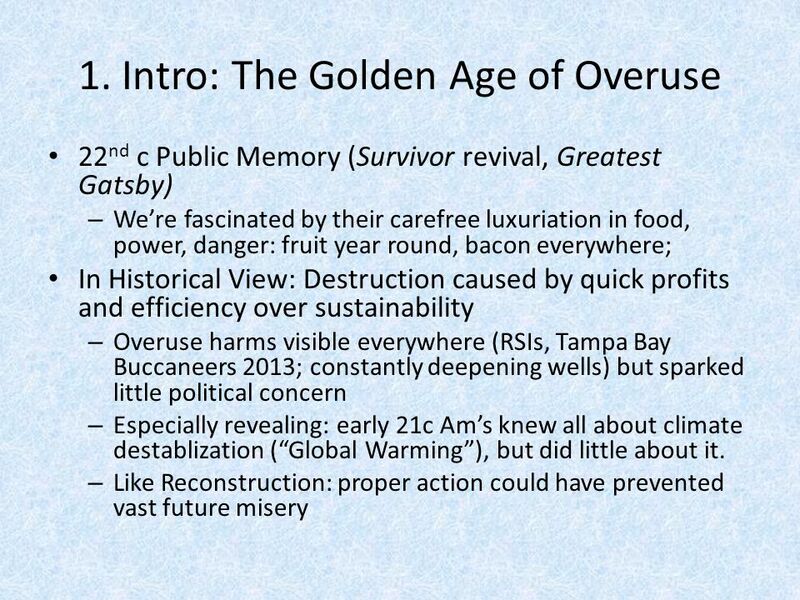 Challenges for a New Century 1980-Present Grade 8 Chapter 29. 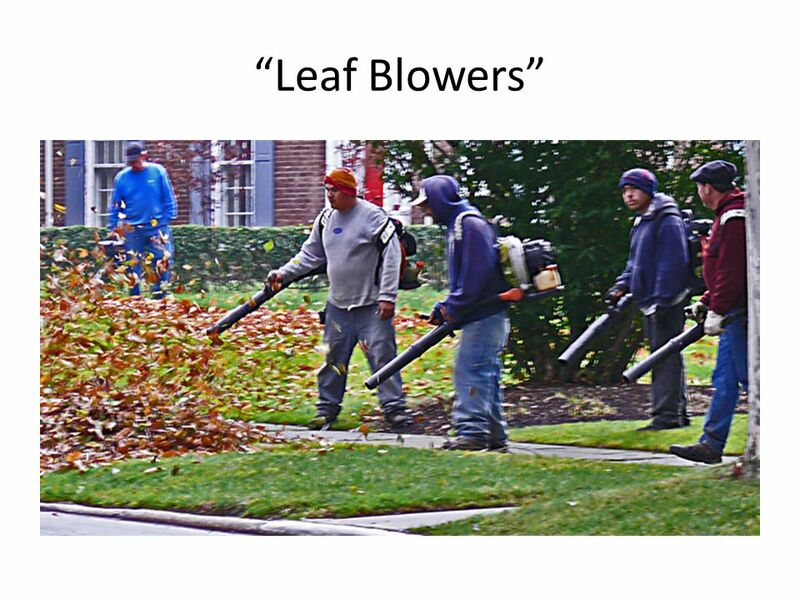 Competing Environmental Discourses Ecological Activists vs. the Ecological Modernists. 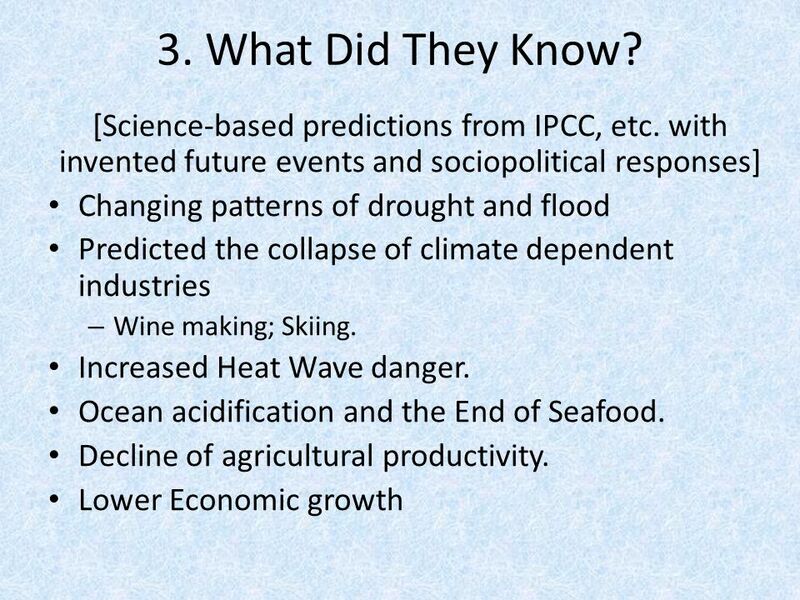 To what extent will Global warming lead to flooding? Some scientists predict that hundreds of millions of people will loose their homes due to flooding. Stearns – 1914-present – Contemporary Period Serious attention needed on this Serious attention needed on this 3 chunks: 3 chunks: 1. WWI/interwar/WWII. Announcements 1.Film showings: Food, Inc Sewell Social Sciences 7:15, Tuesday and Wednesday 2. Open Office hours: Thursday 2-4, 8122D Social Sciences. Announcements 1.Film showings: Food, Inc. 6210 Sewell Social Sciences 7:15, Tuesday and Wednesday 2. Open Office hours: Thursday 2-4, 8122D Social Sciences.